Red Myr and Light Hera Dragon have both been released in the Monster Point shop for 750,000 MP. This places them in Dark Athena territory and are 2.5x more expensive than the regular MP cards. As a result, players are wondering if either of these two new cards are worth their price tag and what factors should be taken into consideration when making a purchase. This article will summarize my thoughts on these two new monsters along with how I approach purchasing a MP card. On a side note, I have successfully moved into MOMtastic’s home and content should begin to roll out once again on a regular basis. Before I even look at Red Myr and Light Hera Dragon, I want to establish my internal checklist for evaluating a MP card’s worth and this will greatly influence my opinions on whether or not to pursue a purchase. How much MP do I have and how fast can I farm/regain it? Will this purchase help me tackle new content/propel myself forward? If the answer is no, why am I considering this purchase? Do I even have a team/use for the new card? What is the future prospects of the card? You should determine how fast you are able to acquire MP as it can impact future purchases. The two most common mediums for acquiring Monster Points are through IAPing or heavy Rogue Descend farming (which you should ideally have a dedicated partner to do so). The second point to consider will vary from person to person as you need to ask yourself what is your current level of progression in PAD. Once that has been established, you must then evaluate whether or not this new card can actually help you clear new content. Naturally, you should have a team that can make use of the new card or subs to compliment their leader skill. There is no point in purchasing a strong card for which you have no relevant cards for. Furthermore, it is important to consider the long term value of the card and what the future look like for them. Puzzle and Dragons will always have Powercreep and you do not wish to purchase someone who is currently on the decline as they will continue to struggle in newer dungeons (looking at you Ra Dragon ). Finally, if you are a newer player, you need to consider the evolution material cost when acquiring a new Monster Point card as you ideally want to fully evolve them right away. 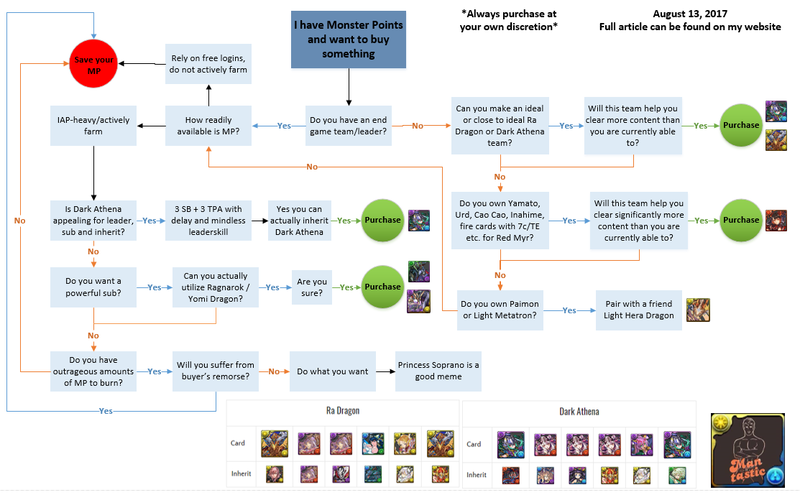 i made this flowchart in August and it is still a reasonable way to summarize the MP cards (with the exception of Odin Dragon who should replace Yomi Dragon in the chart ). Click on the image to enlarge in a new tab. Red Myr is now the strongest heart cross leader in the game but that may or may not be saying very much. The heart cross meta was dominating in 2016 but was eventually surpassed by mono colour and combo-oriented teams. This is because at the time, heart crosses had amazing damage output along with durability, but suffered from an inability to fully combo a board along with being orb hungry. These two factors along with now distressingly low damage has pushed them down. Red Myr attempts to correct this through a RCV multiplier and significantly higher ATK multiplier while also retaining the heart cross damage mitigation component. In fact, you are able to make pure combos for 3x ATK and 3x RCV at 7 combos. This when combined with her own 7 combo awakening leads to team building focusing around this and TPA . While 7 combos may feel daunting on a 6×5 board when you have to dedicate a large portion to the heart cross, it is still doable when taking into consideration that you can simply make 3-matches and let her high multiplier take care of the rest. Unfortunately, Red Myr will still suffer from a lower consistency compared to other top tier leaders simply because she needs to have 5 heart orbs present to trigger her full damage and shielding component. While not being able always activate full damage is an acceptable drawback, losing your defensive multiplier a good portion of the time is not. If you look at the other top tier leaders, they almost always have a reliable/consistent defensive multiplier which enables them to survive through challenging encounters with greater ease. Yes, I am well aware that Red Myr has a strong RCV component, but with no HP multiplier, it will be challenging to survive. Being able to fully heal up does no good when you are one shot. Furthermore, if you do not have 5 hearts, you cannot kill a floor due to too of a multiplier. I would not buy Red Myr as she does not eclipse current leaders and for the price point of 750,000 does not justify her value. Perhaps if she was 300,000 it would be a reasonable consideration, but I feel you are better off with Dark Athena for 750,000 MP (will explain further down). If you are truly set on purchasing Red Myr, you should be making sure you have sufficient fire and heart makers along with cards that have either Time Extends , 7 Combo , or TPA awakenings. Light Hera Dragon utilizes the 5 orb 1 enhance (5o1e) playstyle along with bolstering the HP for God and Devil types. Furthermore, she is very similar to Yomi Dragon but costs 750,000 Monster Points. 5o1e leaders are reasonably orb hungry, but at least the defensive multiplier component for Hera Dragon is consistent so you can tank and absorb large hits. However, no matter how powerful a 5o1e leader is, they will always suffer from the same liability: must have an enhanced orb for damage. Now, having an enhanced orb is easier with ample awakenings, but becomes completely lost when your awoken skills are bound or if your orbs are converted to jammer/poison. When an enhanced orb is changed to jammer/poison, they do not regain their enhanced status if orb changed back. Furthermore, using a board changer can be a risky proposition as you have to pray at least one of your primary orbs retains an enhanced status. To help combat this, many 5o1e teams bring a card who can enhance an off-colour orb to ensure you have access to something enhanced if your primary colour is changed away. Sadly, 5o1e leaders are one of the worst to run in 3P multiplayer unless all players are running cards that bring orb enhances for your preferred colour. If not, you will begin your turn with no enhanced orbs and will never actually have one unless your partners saves some for you as they can only spawn from newly fallen orbs on your turn. All of these points make me loathe to recommend Light Hera Dragon as 5o1e leader are not competative at this point in time. Furthermore, you may be better off pairing with a Light Metatron to add an RCV component and higher multiplier at the cost of having to match crosses instead of any pattern of 5. The same can also be applied to Paimon pairings. Light Hera Dragon should be the last 750,000 MP card you purchase as she offers the least overall value. Furthermore, you do not actually need to own one in order to take advantage of her benefits as you can simply pair with your own Light Metatron and Paimon. If you are really set on purchasing Light Hera Dragon, your priority should be light God and Devil cards who have ample enhanced orb awakenings, especially if they also feature an off-colour one. Dark Athena was the first card to be released for 750,000 Monster Points and while her potency is beginning to fade, she is still amazing for the vast majority of players. Powercreep is a term used to define the gradual increase of power given by new cards and is a healthy part of the game. Essentially, newer cards are marginally stronger than older options and will help you progress into the newly released content. However, Powercreep does not instantly make an older card bad, it just means they are less Meta (most efficient team available) than they were upon their release. With that being said, Dark Athena is becoming a victim to Powercreep, but she can still waltz through content like Arena 3 and only really struggles in the newest Ch10 (can still clear them), 3P Cosmic Trinity, and Colosseum. The reason for this faltering is because she is unable to pump out sufficient damage in those dungeons on a regular basis and will be reliant on active skills. However, for content at or below Arena 3 level, she has more than enough to overcome the common spawns. Taking all of this into consideration, I would still recommend Dark Athena for the average player who is not currently sitting on the edge of current content as she may be the leader required to begin opening doors to Arena farming. Of course if you already own stronger teams/leaders it will not be a worthy investment, but she may be incredible for more players than Red Myr and Light Hera Dragon. Red Myr and Light Hera Dragon are new and flashy MP cards that sadly do not bring enough to the table to justify the 750,000 Monster Point price tag. They may be nice or fun to own but are not powerful enough to truly help a player push into current end game content. Furthermore, the ease and accessibility of Dark Athena players makes them less appealing overall. Let me know what you think about Red Myr and Light Hera Dragon in the comments below and whether or not you purchased either one. I got LHeradra since I was sitting on a bunch of MP and have been working on light teams lately, but without the premier orb enhance subs it’s just ok. I was able to do the current OSC on my first try with her, so she’s definitely good for exploring new content. The main reason I got her is because like Yomidra, I think she’ll be an okay sub on occasion. I really wish the Gentlemen would get upgrades, sigh. Same situation here. Also after looking at the new (absolutely nuts) ultimate arena, I feel that Leradrag and Myr both have a decent shot at beating it (Albeit not consistently). However, I’ve honestly played Myr for way too long, so I bought Leradrag. After looking at my 2 Urds, Yamato, Inahime, and Kuvia. I’m beginning to have some regrets. I can vouch for D.Athena. By using D.Athena, I was able to clear many difficult dungeons (Legend Plus, and sometimes Mythical Plus) without much difficulty. Her damage is insane for the effort (match Dark TPA and one water combo) and her sub-pool is vast. I have experienced the powercreep in the survey dungeons but otherwise, D.Athena propelled me very far into the game and very much worth the 750k MP. Why do you never mention Diablos as a pairing for RMyr if you’re mentioning Paimon and LMeta for LHeraDra? That’s what I’ve been doing, managed to do a3 pretty easily. Only risk is we needed 2 fujins, any less is pretty dangerous. Dath changed the game I was playing. Before her I couldn’t even farm arena 1 consistently. Now I can consistently combo 70%+ of the board and breeze through 95% of content. I’m sitting on 2 mil MP, but these leaders are simply just not that good. Saddening too.. been looking forward to their release for months. I don’t have Leschamali or Lakechi, but I have a top-notch fire squad.. so sad to see RMyr being something of a letdown. At the very least we have a new Barbara sub with RMyr! What are your thoughts about Myr in terms of when Rii comes to NA? I would think she makes Myr infinitely better as a heart cross leader. Would that be a strong enough push for her? Rii is a force multiplier for most teams, so the question is, if you can even roll Rii, does she make RMyr good enough to buy? Obviously RMyr gets way better in that situation, but most other leads do too, so -if- you rolled Rii, you probably still wouldn’t need to buy RMyr. Just curious, will these MP cards become farmable when the new premium REM dungeons come to NA? Srry i don’t have jp account Hope they don’t require stones to enter.. Anyone plz? I want them both to be better. I found myself with enough MP for one of them, and thought that maybe now was the time. But neither look like they would be too useful to me. Since these are the new hotness and we aren’t likely to get more for a while(? ), I think I might reconsider the older MP Dragons for subs. I might get more use out of buying both Ragnarok Dragon and Odin Dragon for less then the cost of one of these. I had a large amount of MP and wanted a new leader – 40+ pulls in the stupid PCGF didn’t bring me a Yog, so I got Lheradra. No regrets. Beat the OSC first try. I wasn’t wild about Red Myr but was interested in Hera – now less-so. I did scoop the new Dark Sonia, though; she fits quite well on my Red Ney team. Having had heart cross leaders as my first truly viable teams last year my choice to get Red Myr was made after piling up all that MP earlier this year. While the Combo X Cross combination truly is fiddly to work around to me it feels a lot like playing Kaede again, who was my favourite leader for a long time. Having Red Myr gives me a good chance to use some of the monsters I’ve been wanting to find a home for for a while, such as Takeru, Ame no Uzume, and my Urds. I’ll be experimenting with Tsubaki and Kuvia as well, having already used my Gadius and Sanada Yukimura as assists. My first major clear with Fire Myr has been the recent One-Shot Challenge, which did also highlight some of the struggles that team has. Nonetheless, I’m enjoying her gameplay quite a bit, and having practice matching around crosses definitely comes in handy. I agree with you’re assessment that she’s not a must-purchase for everyone though, and one should consider the kind of gameplay one enjoys before making such a large investments, especially when you are a fellow (semi-)non-IAP player. PS DAthena has been less of a priority for me because I tend to team friends’ ones up with my Persephone for a reasonable imitation. Speaking of Fire Leaders, were you planning on writing about Fire Athena as well? Her effort-to-damage ratio is super good, but she’s just the glassiest of glass cannons, totally unusable except for fun, and I guess maybe floor 3 of the current Cloud City challenge? technically isn’t myr regalia rei still the strongest heart cross leader?